I want one, don’t care what the donor car was, come the new year something similar will be mine. and I’ll post pictures, in fact, I may post a picture of the sweet cruiser I just got as a winter project, so that you can compare, contrast and drool when you see the chopper I’ll have in January. @AKircher: The chassis is probably all that’s left. 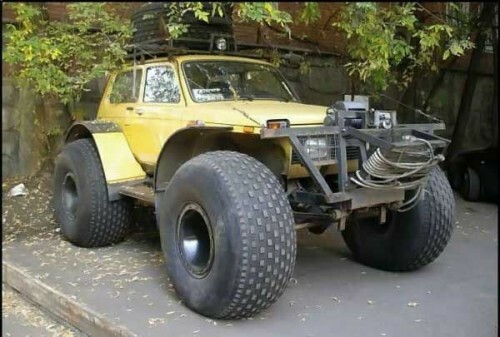 Seriously, Luke…Funny, I used to have a yellow Niva…never crossed my mind I could have done something like THIS to it! The Niva might not even be part of it. The actual car might be wearing the Niva like some kind of car-hat. @ Luke: Yeah! Maybe the Niva body is just to sucker-punch those who think they’re dealing with an underpowered 4-cylinder block under there!